We’re super excited to finally be able to announce that we secretly partnered with Super Rare Games to release a physical collector’s edition of LOVERS on Nintendo Switch. There are only 3000 copies in existance so get yours before they’re gone! 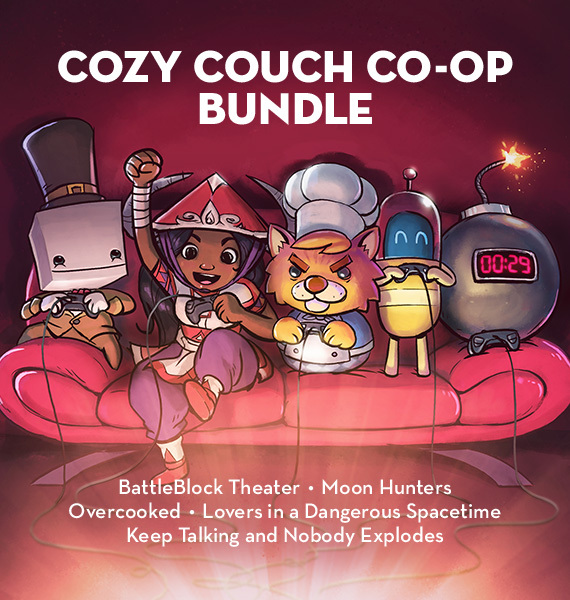 We’re so excited that you can now pick up Lovers in a Dangerous Spacetime alongside BattleBlock Theatre, Overcooked, Keep Talking and Nobody Explodes, and Moon Hunters in the COZY COUCH CO-OP BUNDLE on Steam and SAVE 20%! 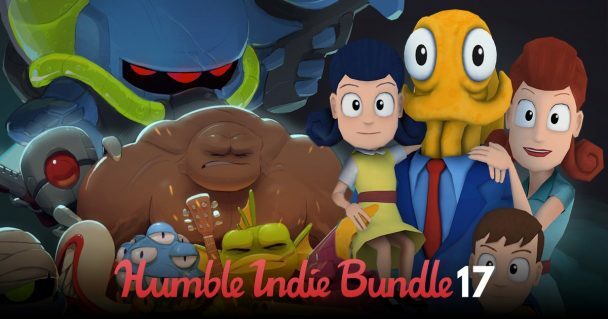 Lover in a Dangerous Spacetime is in the Humble Indie Bundle 17 alongside Super Time Force, Octodad, Nuclear Throne, Galak-Z, Lethal League, The Beginner’s Guide, and more! News // Free 4-Player Update!!! The League of Very Empathetic Rescue Spacenauts (LOVERS) are looking for new recruits and they need your help! Starting now, you will be able to assemble your crew of up to 3 or 4 players. 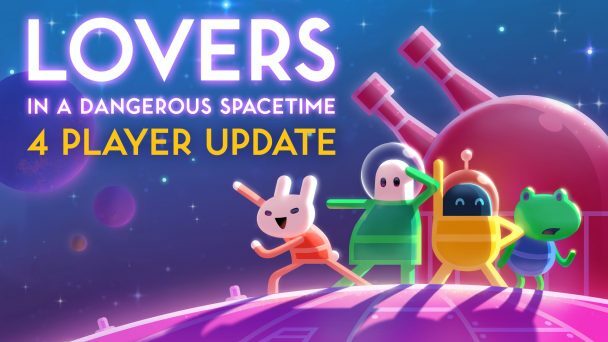 Yes, you read that right… We’re super excited to be able to announce that the free 4-player update for Lovers in a Dangerous Spacetime is available now for Xbox One, PS4, PC, Mac and Linux. We made the critically acclaimed couch co-op space adventure twice as crazy with twice the number of players. This weekend, invite some friends over for pizza and video games, stay up all night with your siblings, or go on a double date in space! News // BAFTAs, nom nom nom! Woke up this morning to the amazing news that Lovers is nominated for 3 BAFTAs (Game Design, Multiplayer, and Debut)! Thanks so much to our British academy pals. Woo commonwealth! And congrats to all the other nominees! 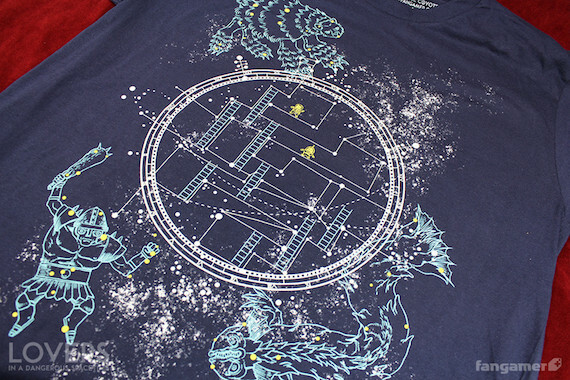 The awesome people at Fangamer have created a LOVERS IN A DANGEROUS SPACETIME T-shirt! 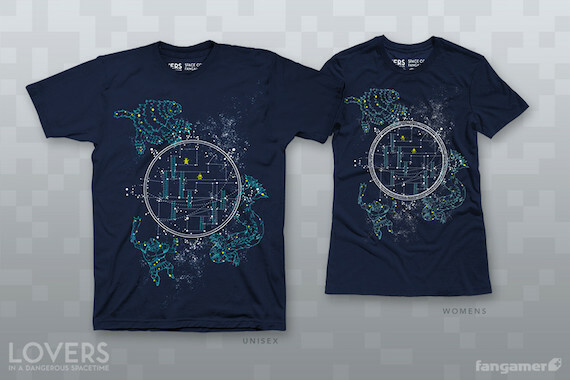 Not only is the design super awesome, but it’s glow-in-the-dark! Get one before they are sold out of this world! News // PS4 Launch and Valentine’s Week Sale! After all, nothing says “love” like a barrage of missiles exploding into a giant robotic space beetle. News // Lovers in a box! Great news to unbox! Lovers in a Dangerous Spacetime is about to enter to our actual reality with a COLLECTOR’S BOX OF ULTIMATE LOVE, thanks to our pals Indiebox. The collector’s box contains gigabuckets of love, plus collectibles, a soundtrack CD, colour manual, Steam key and a DRM-free copy of the game. Having a physical edition is super special to us, as the art department of Asteroid Base HQ first learned to draw by copying weird US Mega Man cartridge art. And it’s something we never thought would happen, until we met Indiebox. Working on all the secret little collectibles with them has been AWESOME. 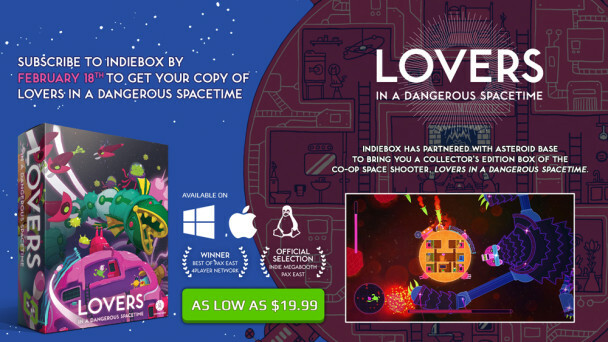 To get the Lovers in a Dangerous Spacetime collector’s box, sign up at Indiebox by Feb 18th, 11:59pm. News // Lovers is coming to PS4! At last! Happy to finally announce that Lovers in a Dangerous Spacetime is coming to PlayStation 4 on February 9 — just in time for Valentine’s day! Adam’s been working like a fiend over the holidays to get the port all spick and span, and we couldn’t be happier with our release date. Read more in Jamie’s post on the PlayStation blog. 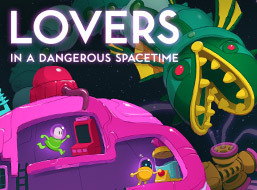 Welcome to the latest edition of Lovers in a Dangerous Spacetime‘s end of the year, year end wrap-up. All I can say is… wow. Thank you, thank you, thank you to everyone who has supported the game (and us!) this year. It’s been a roller coaster to say the least, and in the process of launching our first game I think we have gone through pretty much every emotion… maybe we’ll talk about that in a bit more depth some day! Anyway, we’ve been incredibly fortunate to have the game show up in so many discussions this holiday. Even though four months isn’t that long ago, time flies in videogameland and we’re chuffed that people are still thinking of it.